Experts have dedicated a lot of words to picking the right tent for backpacking, but what about a backpacking quilt? 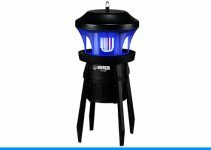 Chances are, you might not even bother setting up a tent on beautiful nights, but you will want something that can keep you just the right temperature during the night. The best backpacking quilt will be more than capable of this. We’ve compiled a list of backpacking quilts we love, so you aren’t just getting a tent and sleeping with no support or insulation. We’ve also answered a few of your questions about how to pick the right one. Let’s take a look. How hard could it possibly be to choose the best backpacking quilt? Well, it might be harder than you think. With no preparation, things like filling and stitching patterns matter a lot, as does fabric type. Let’s go over a few things you’ll want to consider when making your decision. The outer fabric that encases your insulating quilt is called the shell fabric. It’s going to come in contact with the ground and take the brunt of any impact in your pack, so the material on the outside is less comfortable and more durable. The outer material of the backpacking quilt is usually ripstop nylon or polyester, both of which are water and tear resistant. It’s not going to be soft; it’s meant to be tough. The inner fabric usually is softer, meant for insulation but to still allow the body to breathe and reduce condensation within the quilt. It’s softer and likely to wear out sooner than the exterior fabric. One consideration is going to be how best to clean the backpacking quilt when your trip is over. Whatever the regimen is, you want to be sure it’s something you can maintain consistently. The fill provides the insulation. Many people claim that goose down is the best type of fill for backpacking, but you should consider synthetic versions as well. If you consider down, be sure that it’s hydrophobic down so that it doesn’t turn into a lumpy mess at the first sign of moisture. Synthetic insulation is less allergenic and usually waterproof, but it doesn’t offer as much insulation for the weight class. Some offer down/synthetic hybrids that help offset the downsides of each. In some cases, the materials are mixed equally throughout the quilt. In other cases, the materials are located in different parts of the quilt with down filling usually towards the top and synthetic towards the bottom. If you decide to go with down, there’s an extra consideration. The loft of the down describes how many feathers are piled with a known volume. The higher the number, the better the insulation. Who should use a quilt? If you’re a tent camper that moves around a lot, a quilt might be a better solution. It will give you the freedom to reposition without getting caught up in zippers and sides, plus it’s easy to throw off if you get up multiple times during the night. If you have temperature fluctuations throughout the night, the quilt can help you regulate your temperature better. Just throw a foot or arm out of the quilt if you get hot, but put it back when your temperature goes down. Who should use a sleeping bag? If you don’t move around a lot in the night, there isn’t much point in a quilt. A sleeping bag will stay in place with you. If you don’t get up and down, this is also true. If you frequently sleep without a tent, it can take some serious practice to tuck a quilt so that it doesn’t provide a draft. A sleeping bag zips right up to the correct placement. 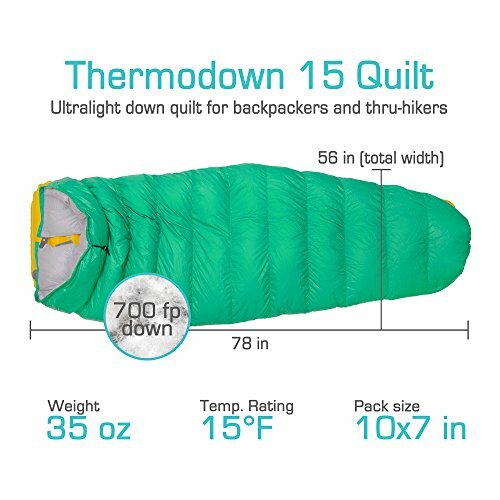 Thermodown’s quilt is an ultralight three season quilt with a down loft of 700. It has a temperature rating of 15 degrees Fahrenheit. It includes a compression sack to help with packing. Including the sack, it weighs just two pounds three ounces and cinches down to ten inches by seven. It includes sleeping straps to help attach the quilt to your sleeping pad so that things don’t get too disorganized in the middle of the night. It’s made of 20D nylon ripstop in the shell fabric, and the full length is 78 inches. It offers generous width of 56 inches, so the quilt accommodates most campers. The down isn’t water resistant, so this quilt is for campers who exclusively tent camp and don’t encounter a lot of wet weather. The shell is water resistant, so the down isn’t likely to clump from small exposure, but be sure to consider this. Kelty’s blanket is insulated with their proprietary synthetic insulation that’s both lightweight and comfortable. It’s a traditional blanket design with quilted weaving to prevent the filling from migrating to one part of the blanket. The shell material is 75D polyester taffeta, a durable material that’s water resistant. The lining is a softer, yet still durable, poly blend. It includes a stuff sack to help you get things packed back down into your pack. It weighs a mere one pound eight ounces, and the total length of the blanket is just over 75.5 inches with a width of 42.5 inches. It’s good for summer camping when things won’t get too cold because it takes a bit to get things tucked more like a sleeping bag. It’s best to use as a blanket. 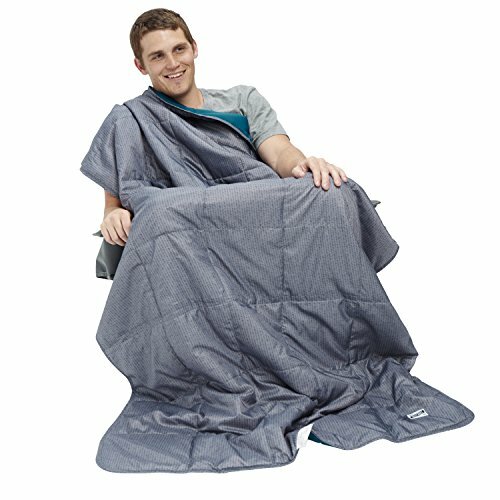 This blanket is a good style for fair weather camping and simple nights when you don’t need much insulation. It’s rated to between 40 and 50 degrees Fahrenheit and is easy to get situated. Its primary purpose is hammock camping. 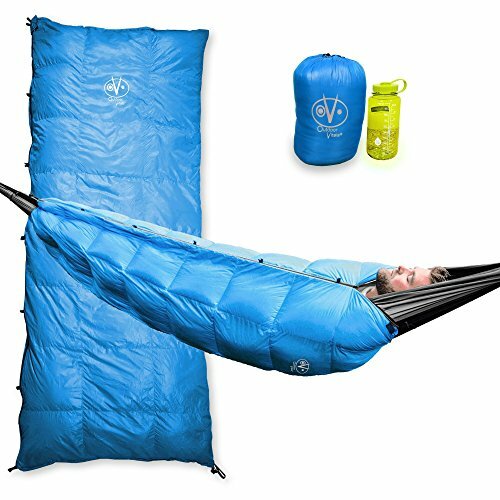 It doesn’t have zippers that can tear your hammock, and it’s great for warmer nights when you don’t want or need an under quilt. It’s made of nylon taffeta treated with durable water repellant to make it resistant to some moisture. It compresses down to an easily packable size with the compression sack. When unpacked, it gives you just under seven feet of length space and just over four feet in width. This is big enough to accommodate most campers, but it isn’t too big to pack down into a pack. The company strives to cut down on fabric waste, so parts of your quilt may be of a slightly different coloring than other parts. 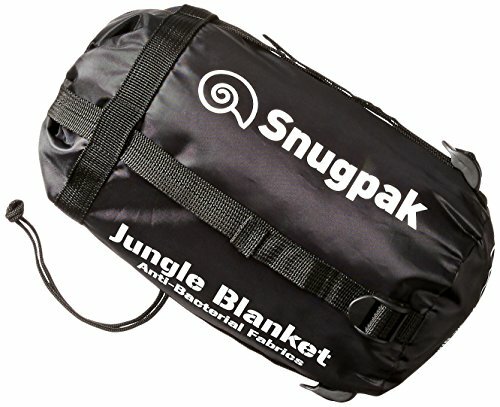 Snugpak is a synthetically insulated blanket with a rating of between 36 and 45 degrees. It compresses down to just six by six inches when fully compressed. The material is antibacterial and antimicrobial. It’s also windproof and water resistant. It gives you a length of just over six feet and a width of just over five feet, making it one of the larger blankets on the list. One particular side of the blanket is thoroughly water resistant while the other side is softer and more comfortable. 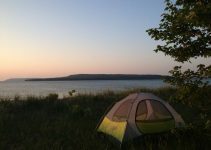 It’s good for people who need something extra during their camping, whether hammock camping or layering in the tent. Mountain Hardwear’s quilt is a highly compressible, synthetic fill quilt that packs down ultralight. The fleece stuff sack doubles as a pillow when not packed down. It weighs just over two pounds, and the fabric body is a 75D plain weave. It’s water resistant and dirt resistant. Inside length is 92 inches, an impressive amount of space for those who might be on the taller side. It offers a symmetrical 54 inches in width throughout the length of the quilt. Once in the compression sack, it’s only six inches wide and 20 inches in length. It’s on the warmer side, and good to use in conjunction with other sleeping materials on freezing nights when you’re camping for extended periods of time. The Corus is a 650 loft, hydrophobic down filled quilt. It’s rated between 35 and 45 degrees, but when used in conjunction with other gear can easily withstand colder than that. It has a foot box and elasticized straps to help the quilt stay in place overnight despite your movements. Full perimeter baffling helps the quilt prevent drafts, and the seaming helps to retain radiant heat so you’ll stay warm as long as the quilt remains in place. It’s lightweight and easy to pack down into a smaller backpacking space. It’s the best backpacking quilt if packed size is your primary concern. Where weight and bulk needs to be minimal. If you need something really warm, you might want something with a higher loft that doesn’t pack down as small. This one errs on the side of space rather than loft. Mountain Hardwear’s flippable bag is a down filled option that can be reversed based on how cold it is during your trip. On one side, the down is rated to 35 degrees Fahrenheit. If you flip it over, the other side is less filled and a cooler option at around 50 degrees. It’s a semi-rectangular shape with seams that prevent cold spots and keep the down from settling. You can zip it into a rectangular bag or use it alone. The outside is durable nylon that’s water and dirt resistant. It’s certified by the Responsible Down Standard meaning the down was harvested sustainably and humanely. It includes a stuff sack and a mesh bag for storage. There are chest height pockets for some of your essentials. It weighs just over a pound with a length of 76 inches. The widest section of the shoulder is 62 inches, but it tapers down at the feet to 38 inches at the very bottom. There’s a drawstring hood to help keep out the cold, and the dual zipper design allows the foot box to open entirely so that you can use it as a quilt. It has a draft panel to keep cold air from coming through the zippers. 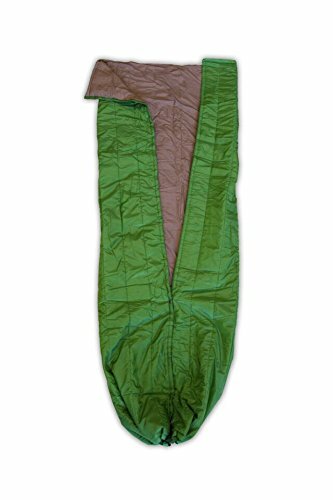 Nemo’s blanket is a very soft synthetic insulation blanket best used as a camping accessory with other bags or alone on a warmer night. The exterior is a soft nylon ripstop that’s washable but still a tough 40 denier ripstop with a DWR (water resistant) coating. It has catenary edges that make it ideal for wrapping around you or your sleeping pad. There’s also a foot nook so you can tuck your feet and keep them from slipping out of the blanket. It includes a storage bag weighs just under two pounds. It gives you a length of 85 inches, and the width is 57 inches. It’s not going to be big enough to wrap around two people or for couples to use it unless they sleep seriously close. It’s best for both to get their own blankets, not that this is terrible news! 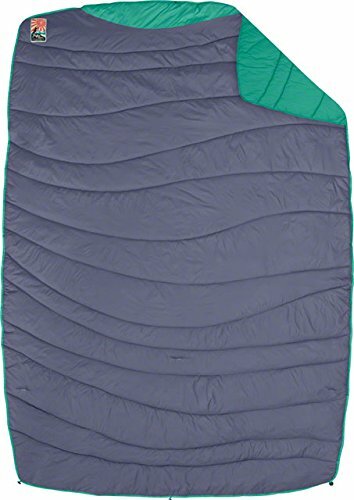 The Apogee Quilt is another synthetic fill, lightweight quilt rated between 40 and 50 degrees Fahrenheit. 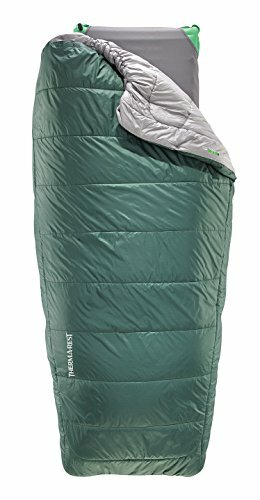 It’s great for colder nights during camping when you don’t want to drag out your huge sleeping bag, but you still need something on the warm and heavy side to be comfortable. The shell fabric is 20D polyester ripstop with a water-resistant coating. The interior is also 20D polyester. The quilt should stand up to years of camping without showing signs of wear. It’s a soft, quilt but still feels nice and weighty. It has an elastic footbed with a full-length draft tube to block drafts. You can also use the straps to attach it to a compatible camping pad to keep everything from moving around in the night. THere are two sizes, a large that accommodates a camper just over six feet and the regular that accommodates a camper just under six feet. The regular weight is nearly two pounds while the large adds just a few ounces to put it just over two pounds. The widest point is 48 inches for regular size and 58 for large. It tapers down to 21 and 24 inches at the bottom. 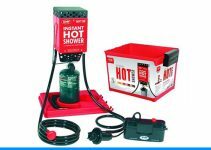 It’s an excellent addition to camping when you aren’t sure what the temperature will do. If it’s colder, combine it with other bags to give added warmth. If the temperature doesn’t drop, it’s a comfortable choice on its own. Outdoor Vitals has given us a multipurpose quilt that serves five uses in one. It can be an under quilt, a technical blanket, a sleeping bag, a double sleeping bag, or part of a hammock pod system. 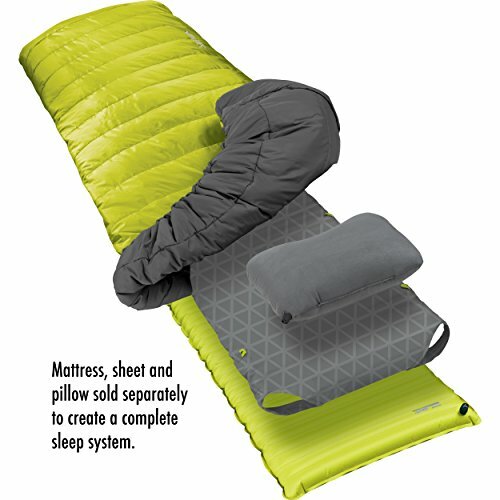 As an all rounder, this is considered by many to be the best backpacking quilt. It’s an 800-plus loft down filled blanket with responsibly sourced down and treated with DWR (a water-resistant coating.) It’s rated to about 30 degrees Fahrenheit and has a 20D ripstop nylon shell fabric with a 20D ripstop lining. It weighs just under two pounds when packed and offers a length that will accommodate heights of up to six and a half feet. It has hammock loops and a drawstring on each side to keep drafts out. Not hammock camping? Just zip it up like a regular sleeping bag. Too warm for a sleeping bag? It opens up fully to be used as a quilt. It packs down to just nine by seven by seven and includes a compression sack to make getting back into ideal packed mode a lot easier.